Apologies for the slow update. I just returned from a holiday last weekend and had to readjust to the hot weather here so I've been a bit sluggish. Happy Valentine's Day for you all, belatedly for those in Australasia and Europe, but still within the day for friends in the American continent. I've actually been writing a post for V-day, but I haven't finished it. Hence this post in lieu: a letter from Barbara to her UK family, containing Fearless Duo 1984 and United We Stand 1984. In her only letter containing UWS and FD, Barbara also mentioned a 10 days tour with Michael on 15 May, a day after UWS was aired (and a year before her death...). Not sure where the tour was, was it in Malaysia or Singapore? I need to look into this later. Also we learn that Shela (Barbara's aunt now, now that Shela has married Barbara's uncle) had given birth to a baby (Andrew Chan). In June 1984, Barbara and Kent Tong went to UK to visit her family. 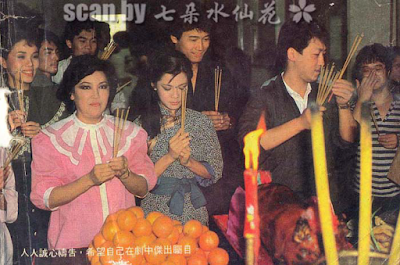 Afterwards, directly she filmed Chor Lau Heung with Michael as described in her June 1984 letter (seems to be dated 22 June 1984). It's so exciting to hear the baby birth, everybody I told are happy for you. I don't know what to buy to congratulate you, only buy these three "Family happiness" to you, wish you happy. I like the most the toy is that boy doll Shela carried on the back, and the boy wore a straw hat, does he like Uncle? Somewhat foolish, just like a FISHER MAN, HAHA! You cab hardly deny it. The baby must have much hair now, however, does he look like Uncle? Most importantly, hope he won't be silly like you, that'll be okay. He'd better like me, his Aunty who is bright! ( Barbara may mistake the generation between the baby and her, actually she and the baby are in same generation, she is sister of the baby, not his Aunty) I believe you must expect much on the baby just like you expected on me ever, even I begin to worry about him. I haven't got free time to buy mother card, so I sent a self made card to Mom. It's an exclusive card of the world, so it's unique. The photo is the look of one of the role of twins girl of "United We Stand 1984". And some dry mango for you also with the video tape of "The Fearless Duo 1984". My new drama will be broadcasted on 14th May, then you can watch. I'll attend a stage show for ten days with Michael Miu on 15th May. I just have phone call with Ah-gyun, haven't seen Miss Ng and surrogate Mother because I was busy these days. I'll take care of myself, don't miss me. I clipped photos of my room on all weekly, is it good? Alas, I didn't find two others, I'll send you next time, okay? It's too late, I'm tired to write. Wish you all keep well, Mum, take good care of yourself.